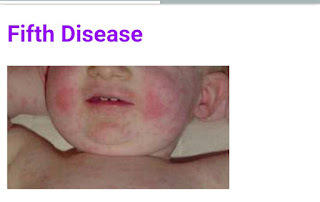 Fifth disease is caused by a virus that often results in a red rash on the arms, legs, and cheeks. For this reason, it is also known as “slapped cheek disease.” It is fairly common and mild in most children, but it can be more severe for pregnant women or anyone with a compromised immune system. Most doctors advise their patients to wait out the symptoms because currently there is no medication that will shorten the course of the disease. However, patients with weakened immune systems may need to be monitored until the symptoms disappear. Fifth disease is caused by a virus, called parvovirus B19, which tends to spread among children in elementary school. It is most prevalent in the winter and spring, but it can spread at any time and among people of any age. Many adults have antibodies that prevent them from developing fifth disease because of previous exposure during childhood. However, when individuals do become infected as adults, the symptoms can be severe. When pregnant women get fifth disease, there are serious risks for the unborn baby. For children with healthy immune systems, fifth disease is a common, mild illness that rarely presents lasting consequences. After a few days of suffering with these symptoms, most young patients develop a red rash that first appears on the cheeks. The rash often spreads to the arms, legs, and trunk of the body within a few days. The rash may last for weeks, but usually by the time you see it you are no longer contagious. The rash is more likely to appear in children than in adults with fifth disease. In fact, the main symptom adults usually experience is joint pain. The joint pain can last for several weeks and is usually most prominent in the wrists, ankles, and knees. For most healthy patients, no treatment is necessary. If your joints hurt or you have a headache or fever, you may be advised to take acetaminophen (Tylenol) as needed to relieve these symptoms. Otherwise, you will just need to wait for your body to fight off the virus, which usually takes one to three weeks. You can help the process along by drinking a lot of fluids and getting extra rest. Children can often return to school once the red rash appears since they are no longer contagious.